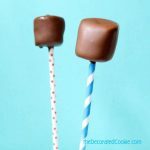 These silly marshmallow kabobs with chocolate dip will certainly get conversations moving at your next shindig. 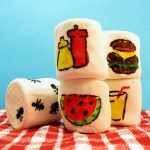 I’m no stranger to drawing on marshmallows. I’ve even created an entire marshmallow dinner. 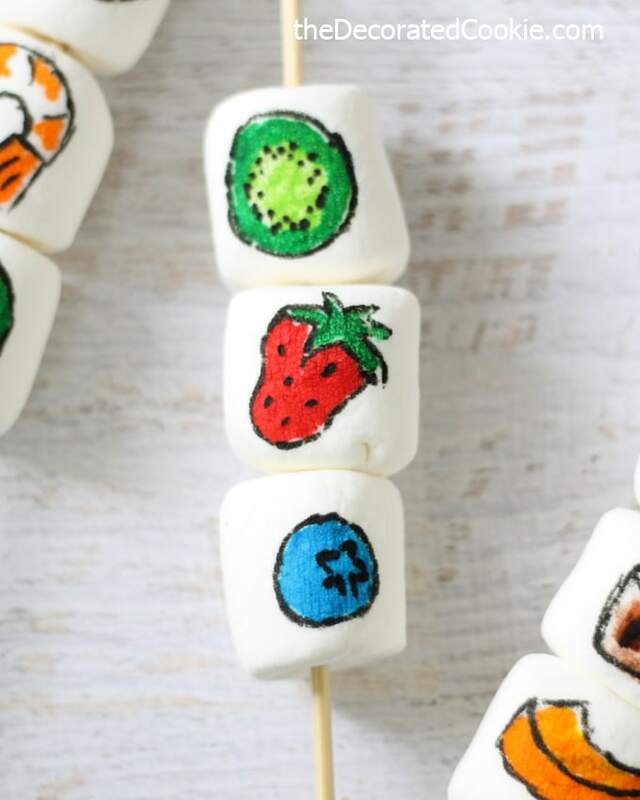 So these silly marshmallow kabobs aren’t too far of a stretch. 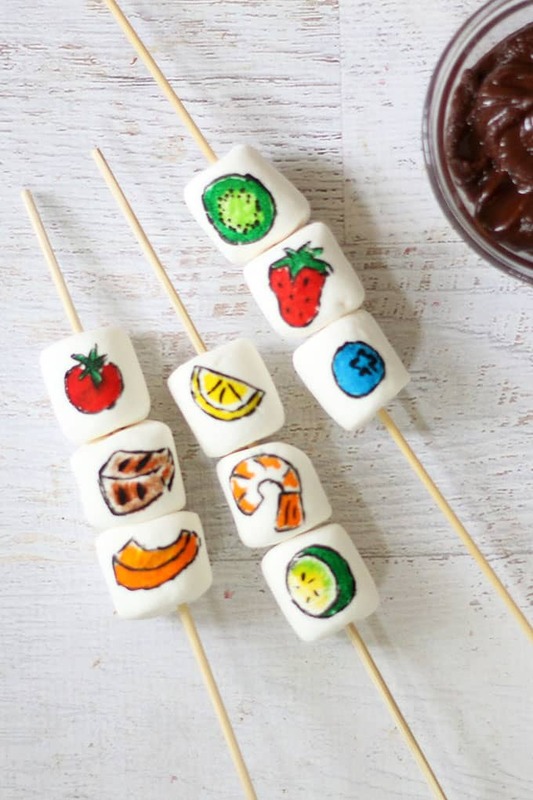 You can draw any foods you like on the marshmallows. They are probably better for a summer BBQ, huh? Or… a faux BBQ for indoors during the cold months? Yes, let’s go with that. Or trip up Thanksgiving dinner with these as dessert. I chose shrimp kabobs with shrimp, lemon and zucchini. Some fruit kabobs with kiwi, strawberry and blueberry. And chicken kabobs with chicken, orange pepper and tomato. 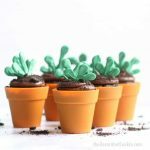 You can use any of your favorite recipes for chocolate dip or fondue. 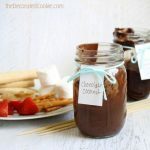 I love this easy, smooth chocolate coconut fondue that takes minutes to make and doesn’t need to be kept on heat. The chocolate here is a very simple combination of butter and chocolate chips to make a rich chocolate dip. UPDATE: Here’s a video how-to. 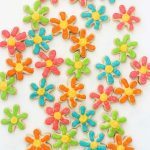 *Find the edible writers at the craft store or online. 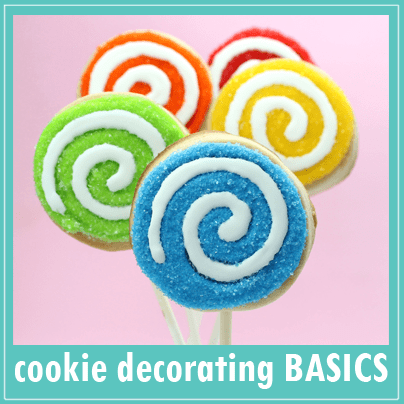 Click HERE for tips on edible writers. Or, check below for Supplies. 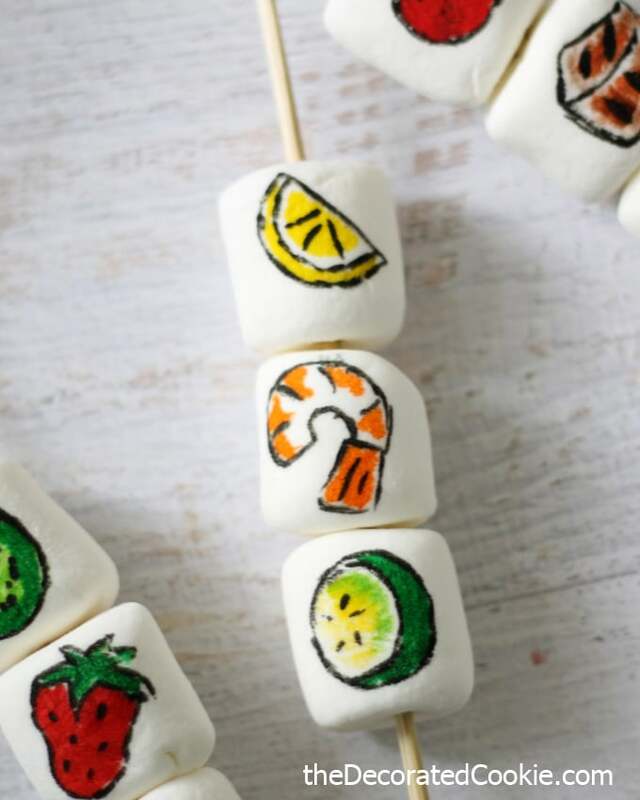 what to do: Slide a few marshmallows on a skewer. 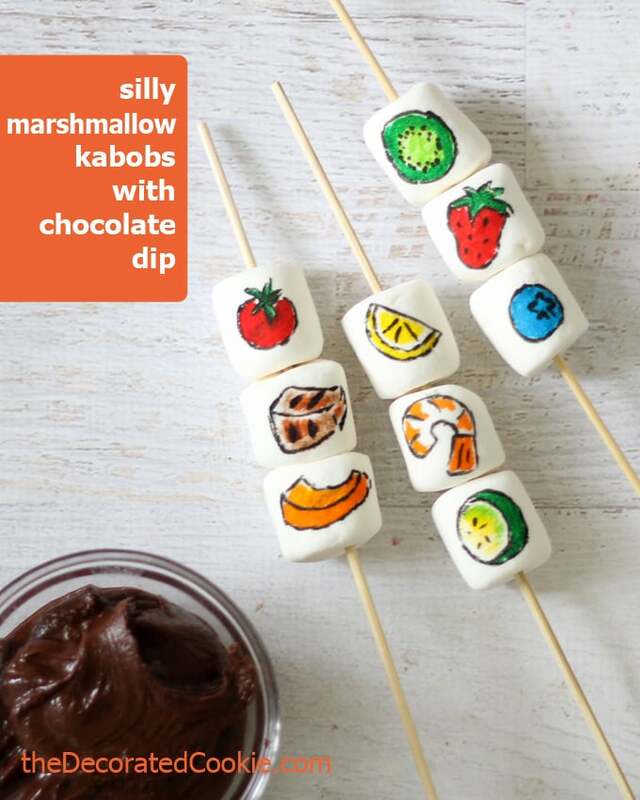 TIP: Rub a bit of vegetable shortening on the stick first for easy marshmallow sliding. 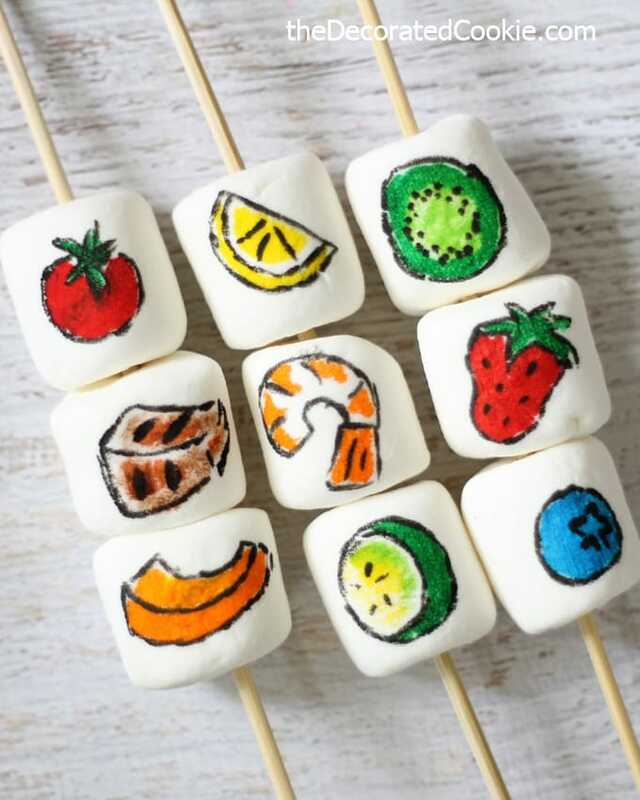 With the edible writers, draw food designs on the marshmallows. 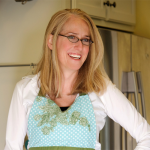 For lots of how-tos for using edible writers, click HERE. To make the chocolate dip, place the chocolate chips and butter in a microwave-save bowl. Microwave for 90 seconds at 70 percent power. Stir well until smooth. If needed, continue to microwave at 15 second intervals. 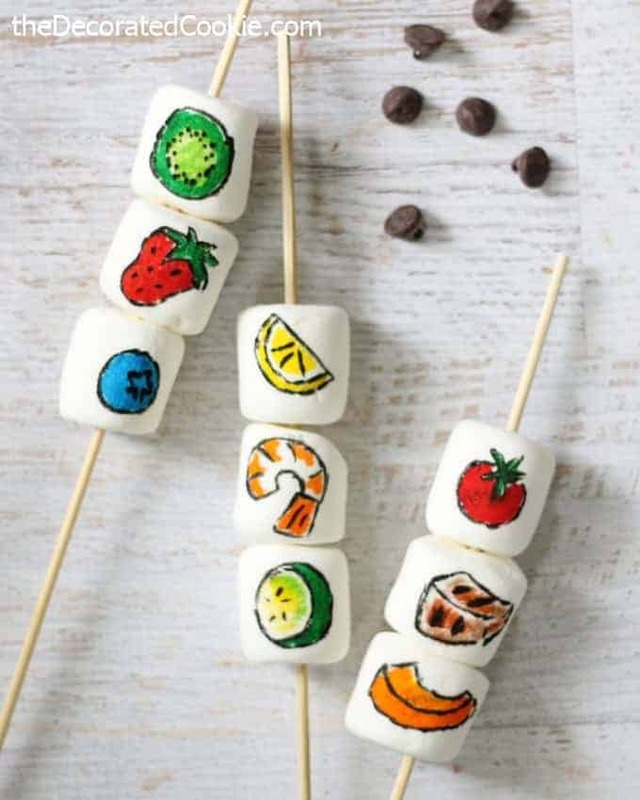 Slide a few marshmallows on a skewer. 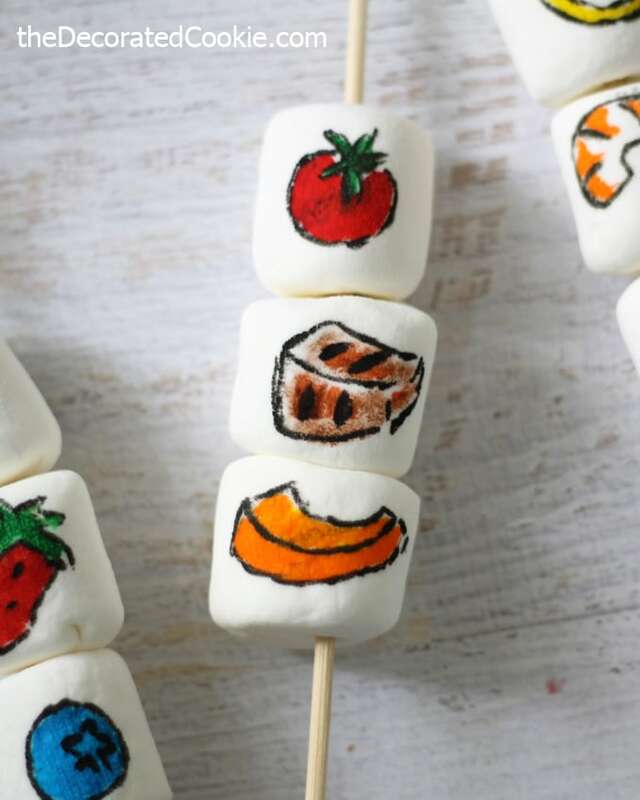 TIP: Rub a bit of vegetable shortening on the stick first for easy marshmallow sliding. 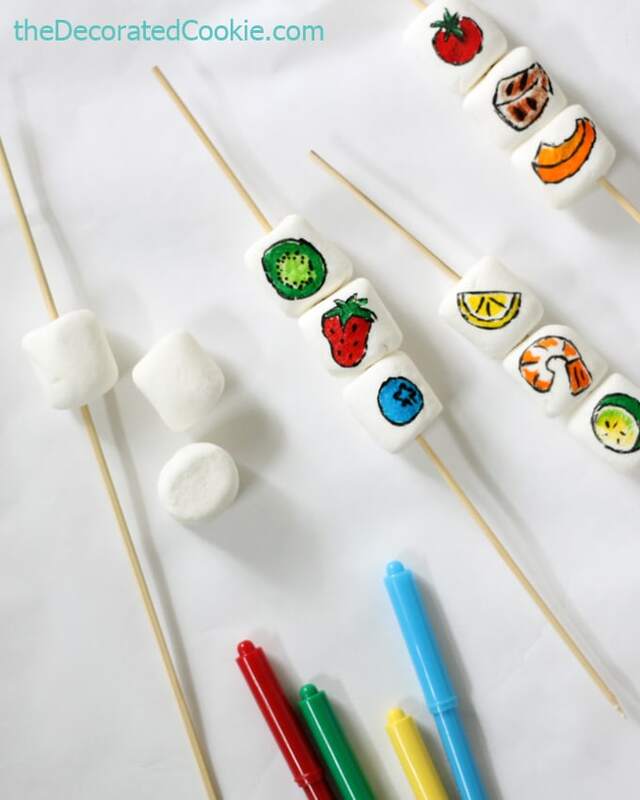 With the edible writers, draw food designs on the marshmallows. To make the chocolate dip, place the chocolate chips and butter in a microwave-save bowl. Microwave for 90 seconds at 70 percent power. Stir well until smooth. If needed, continue to microwave at 15 second intervals. Serve immediately. 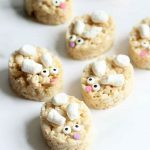 « Wild Eats and Adorable Treats Book Review and GIVEAWAY! Wow! Love this. 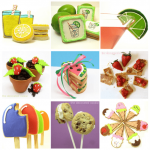 I found it on Emmas Twitter page – Kids Craft Room. 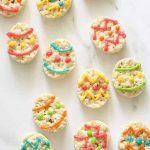 She is an amazing tweeter 🙂 Anyhow, yummed, pinned and am inviting you to come next week to our Wonderful Wednesday Blog Hop to share this and other awesome posts? My readers will love it! Ooh, awesome, thank you Ducks na Row! I’m going to go visit her twitter now :).